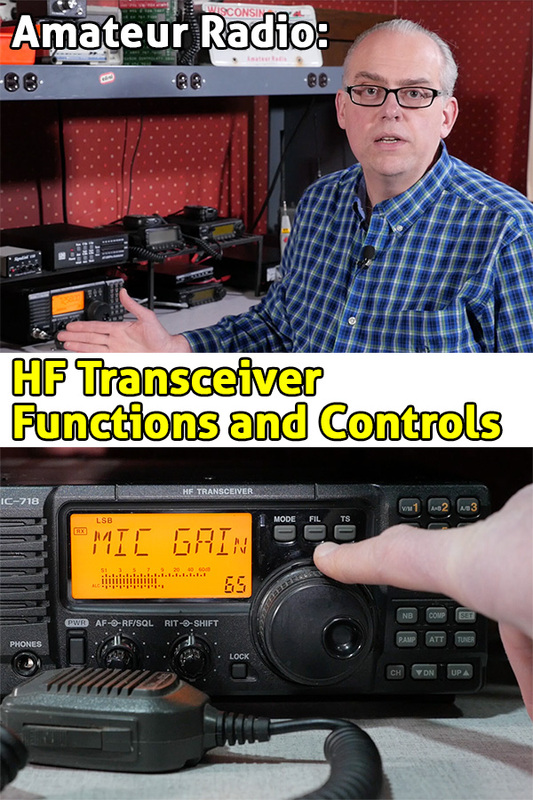 Today we’re about going to talk about HF radio transceiver controls and function. We’ll also talk a bit about the vocabulary or jargon that is specific to the receive and transmit functions of an HF transceiver. This presentation is designed as a companion for chapter 5.1, Amateur Radio Equipment for the ARRL Technician Class Ham Radio License Manual 3rd edition and it should be relevant to later editions of the guide. 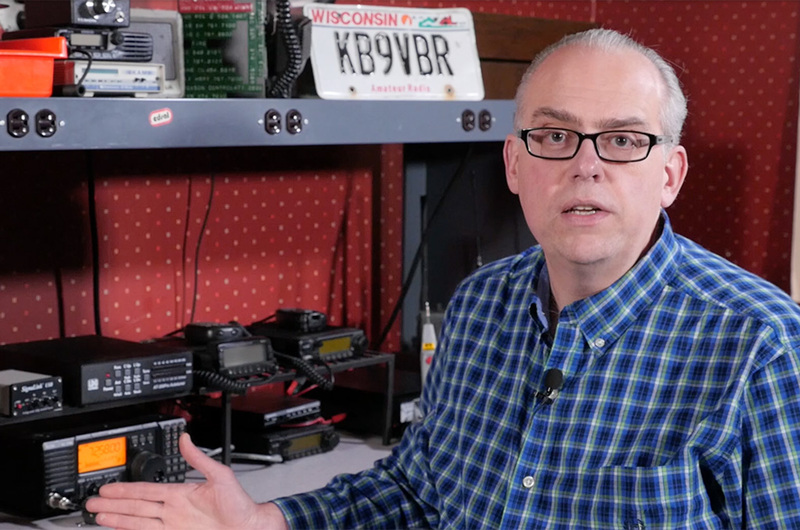 If you are studying for your Technician license, you’ll find this information quite helpful or if you’re in the process of purchasing your first HF rig, the content of this video will be a great refresher. So let’s dig into things. The following text is a transcript of the video, so please watch the video on the physical demonstration of the transceiver. For our demonstration we are going to use the Icom IC-718 HF transceiver. This is a basic radio that is popular among new hams and those looking for a simple, inexpensive HF transceiver. It’s a solid radio and has enjoyed a very long product life, the one I’m using today I purchased back in 2001. But don’t worry too much about the actual model I’m demonstrating as these features and controls are common to all modern HF transceivers. I’m going to start out by pressing the power button and turning on the radio. Next up will be the Band and Frequency selection. 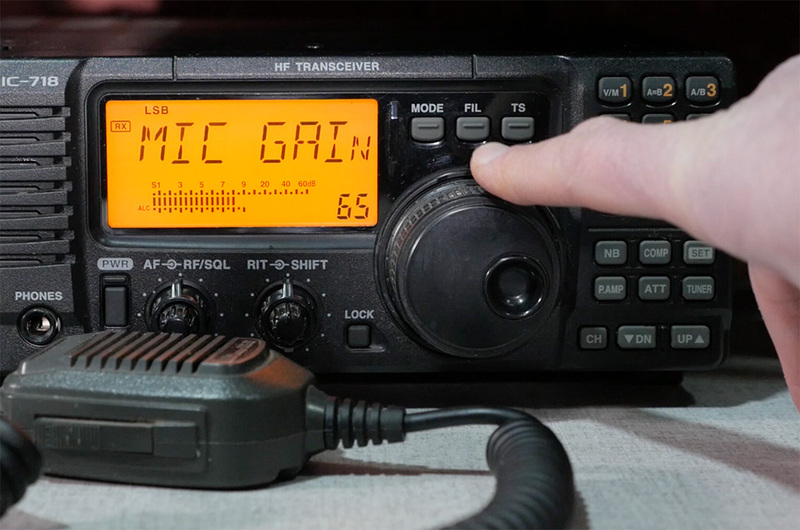 This is a feature that’s fundamental to all amateur transceivers. You can set the frequency via the tuning knob which controls the Variable Frequency Oscillator or VFO. You can also select frequencies with the direct entry on the radio’s keypad. On HF most the tuning is done with the VFO knob. Band selection is accomplished by pressing the up and down buttons on the keypad. Next up is the mode selector. HF transceivers are considered multi-mode transceivers you can select different methods of modulation like AM, FM, Single Side-Band, CW or a data mode like RTTY. Here on the IC-718 I can toggle through the available modes: Upper or lower sideband, AM, RTTY or CW. Moving on to the microphone controls, there are a wide variety of microphone styles that can be used such as the hand mic, desk mic, or a headset or boom mic. Your mic choice will depend on operating style and function. All radios come with the hand mic, so that will be the most popular choice, but you may find a desk mic to be more comfortable. I like to use a headset with the boom mic if I’m working a contest or some other operating event. On the microphone you’ll find the Push to Talk or PTT switch. The Push to Talk function switches between receive and transmit on the transceiver. The way we speak into the microphone can affect the audio level and power of the signal. A louder voice level translates into a bigger waveform and a quiet voice means less power output. But you will want to use a normal, conversational voice when you speak into the microphone. We can adjust the transmitter’s microphone sensitivity with the Gain control. The high the mic gain, the more sensitive it is to your voice. The radio will also have a speech compressor or processor. The compressor increases microphone gain at lower sound levels to increase the overall signal strength or punch. But too much gain or compression can cause problems such as splatter, over-deviation, and over-modulation. Splatter and over modulation is poor amateur radio practice. So the transceiver has a function called Automatic Level Control ALC to limit speech modulation and reduce transmitter overdrive. The ALC is often represented as a graph on the display or meter. You will set the microphone gain so that ALC level does not go over the scale and distort the output signal. This setting is unique to each person’s voice quality and microphone so a bit of experimentation will be in order. Moving on to receiver controls, the AF Gain or Volume controls the audio level to the speaker or headphones. Next is RF Gain, which controls the gain of the receiver’s input amplifier. You’ll see that the Icom the AF Gain and RF Gain are grouped together on the same knob, they share similar functions and can be used to adjust the signal to noise ratio of a received signal. If you encounter a very loud signal or a large amount of background noise, you can switch on the attenuator to reduce the strength of the received signal. If you have a very weak signal you are trying to copy, the Preamplifier or PREAMP can increase the sensitivity of the receiver. Next to the AF gain control is the Receiver Incremental Tuning or RIT. This is a fine tuning control that allows you to adjust the receive frequency independent of the main VFO. This is handy to adjust the voice pitch of a received signal if it seems too high or or. The RIT function does not vary the transmitted frequency. Most transceivers will use an Automatic Gain Control or AGC to keep the audio level relatively constant. It limits the incoming signals peaks to maintain even volume. This is to keep strong signals from blasting the listener. The Icom has a squelch control. It’s located on the same knob as the RF gain. If you move the RF gain past the 12 o’clock position, the squelch is activated. This mutes the audio to the speaker when a signal is not present. Squelch, though, is more commonly used on FM transceivers and has limited use on sideband. Many receivers have filters. The filters reduce noise or interference by selecting a bandwidth that matches the mode of operation. The IC-718, being an entry level transceiver does not come with any, but a narrow 500 hertz filter for CW or a 2400 hertz for sideband can be added to it. Filters are used to narrow the width of the signal that is passed and can attenuate adjacent signals. The notch filter is a very narrow filter that can attenuate an interfering signal. Other controls include the Noise Blanker. This removes signal pulses frequently associated with random naturally generated noise. If your receiver is mounted in a vehicle, the noise blanker would be used to reduce ignition interference. The IC-718 has a Noise Reduction button to activate the Digital Signal Process to remove background noise. Those are the basic controls and functions of an HF transceiver. Like I mentioned earlier, you will find these functions on almost all modern transceivers. I think just about every solid state transceiver I’ve used has these basic features. Compact transceivers may have the features hidden behind on screen menus and top of the line rigs will have a button for everything and them some. But once you know the basic features, it will only be a matter of acquainting yourself with the operational layout of the transceiver. Do you have any questions about basic transceiver functions? Please leave them in the comments below.